Greetings, Citizens. Join us as we review some of your favorite films. The film list includes comic book movies, the James Bond series, Star Wars and more. We'll be working chronologically from 1951 to the present. 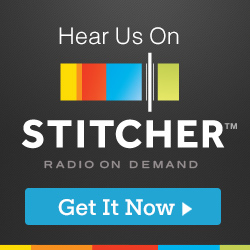 You can subscribe to the show on iTunes and Stitcher. Find us on Facebook and Twitter. Rory M. Spence is back with us to visit our old pal Superman as he deals with the latest scheme of Lex Luthor’s. Of course we’re talking about Superman IV: The Quest for Peace. Weigh in with your thoughts over on the League of Citizens Facebook group. Next time on Reel Comic Heroes - Masters of the Universe. The future is here. And so is Rick Ingham from Mad Max Minute to talk about RoboCop. Join our Facebook group, The Reel Comic Heroes League of Citizens and let us know what you think of RoboCop. We will return with the final chapter in the Christopher Reeve Superman franchise with Superman IV: The Quest for Peace. We’re back and we’re taking a look at the 1987 Joe Dante classic(?) ‘Innerspace’. Joining us on a journey to discover the hero within us all is Brett Vicchrilli. Don't forget to rate and review the show on Apple Podcasts. It would mean a lot to us. Stay in touch with the show on Twitter. Send us thoughts, questions, or comments to reelcomicheroes@gmail.com and we'll address them on a future episode. Watching a Bond movie is sort of like coming back home. But this time, it’s like coming home, and finding out that someone else has moved in. We’re looking at a new James Bond for the first time in quite a while. Timothy Dalton takes over as 007 in ‘The Living Daylights’. Find out what we thought, and let us know what you think. Join our Facebook group ‘Reel Comic Heroes - League of Citizens’ to discuss this and any other geeky topic on your mind. Next time on Reel Comic Heroes - InnerSpace. This is a big deal for Travis and Patrick. Spaceballs has in some way been a part of our show from very early on. Patrick loves it. Travis is indifferent to it. Is Spaceballs a classic? Maybe. Rory M. Spence from the Doghair Network is with us again to find out if Spaceballs is any good. Check out Rory’s shows Hangover Reviews and Doghair Presents. Here's the shirt Travis got for Patrick way before this episode ever happened. Next time on Reel Comic Heroes - The Living Daylights. The Mt. Rushmore of 80’s action movie stars would undoubtedly feature the face of Arnold Schwarzenegger. And his role as Dutch in ‘Predator’ would be reason enough to put him there. Predator is at its core an action movie about an elite rescue team who are the best at getting into a tough situation and staying alive. Until they run into someone, or something better at hunting than they could’ve ever imagined. Rory M. Spence from the Doghair Network joins us once again to see if this 80s action spectacular stands the test of time. Check out Rory’s shows Hangover Reviews and Doghair Presents. Next time on Reel Comic Heroes - Spaceballs. We want your thoughts on Spaceballs! We’ve been building up to it for a long time and we want you to be a part of the episode. Send us your thoughts, comments, questions about Spaceballs and we’ll share them on the episode. Send them to reelcomicheroes@gmail.com. The first time we tried to review Evil Dead, it was so evil, the episode was possessed by a demon and we had to destroy it. Listen to the story of the “Lost Pod” here. Just like Ashley Williams, we’ve returned to the cabin for Evil Dead II: Dead by Dawn. But this time, we’ve brought help. Joining us against the forces of evil are Brandon Peters and Cullen Bricker from the Cult Cinema Cavalcade podcast. Be sure to let us know your thoughts on Evil Dead II by emailing or tweeting to us and we’ll share your thoughts on a future episode. It may be the fourth movie, but it’s the third in a trilogy. Star Trek IV: The Voyage Home closes out the story of Kirk and the Crew of the Enterprise and their journey to get their old friend, Spock back. And if there’s time, pick up a few humpback whales from the 1980s, bring them to the 23rd century and stop the destruction of Earth. Joining us in our maneuver to go back to the future is Adam Hartvigsen from Dark Knight Minute. “You got the touch!” It’s our first animated film, Citizens, and it’s sure to be a nostalgic trip for some of you. In this episode we’re revisiting The Transformers: The Movie. Joining us is Thomas Howeth, and he brings a lot of love and information to this episode. As always, reach out and let us know what you think. Thomas is from the podcasts Neverending Minute as well as X-Minutes. One is a ‘Movies By Minutes’ podcast about The Neverending Story, and the other about the X-Men film franchise. We’ll let you guess which is which. Be sure to subscribe to the podcast via iTunes, Stitcher, or whichever podcast app you prefer. Join us Citizens, as we continue our mission to review the geekiest and the cultiest movies from the past. This episode we’re returning to the work of the Master of Horror, John Carpenter in his 1986 cult classic - Big Trouble in Little China. We’re also getting to talk about Kurt Russell again, who previously teamed up with Carpenter on The Thing. As long as you do what Jack Burton says, you’ll get through this one just fine. Joining us in the wasteland is returning guest - Pete McCue from the Battlestar Galactica podcast: Resurrection Cast. This episode wraps up our coverage of the “original trilogy”. Not THAT “original trilogy”, the one set in a post-apocalyptic Australia ruled by barbaric tribes and one man who stands alone (except for when he stand with others). This time on Reel Comic Heroes, we’re talking about Mad Max: Beyond Thunderdome! Sir Roger Moore embodied the role of British Agent 007 for 12 years in 7 Bond movies. He was the longest-serving James Bond actor. Join us as we take a look at Moore’s last outing as James Bond in 1985s A View to a Kill. Please take a moment and subscribe to the show and rate us on iTunes! We’re back for another adventure and this time we’re revisiting a family we haven’t had an adventure with in a while. So sit down with your family to enjoy this family adventure of an adventuring family. 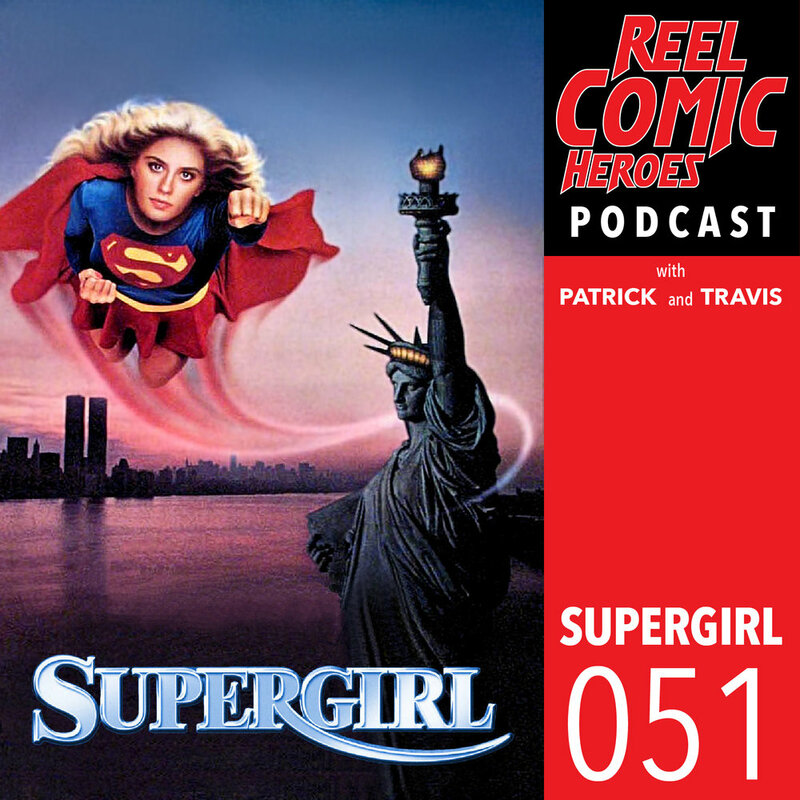 This episode is all about the 1984 Supergirl motion picture starring Helen Slater! and instead finds herself up against a wicked witch. The battle to fight the future has to start somewhere. No one would have suspected it would start with a lousy waitress who struggles with getting stood up and balancing her checkbook. Linda Hamilton is Sarah Connor in The Terminator. Joining us to talk about humanity’s hope for the future is Courtney. Courtney joins us from the Resurrection Cast, a podcast which is no stranger to strong female characters. Let us know what you think about The Terminator. Follow Courtney on her podcast - The Resurrection Cast - as she takes two nuggets on their first journey through the reimagined Battlestar Galactica series, one episode at a time. Is there anything Conan can’t do? He’s battled giant snakes, rescued princesses and cut the head off of Thulsa Doom. Now he must face the ultimate challenge - getting overshadowed by Wilt Chamberlain. It is time for Conan the Destroyer. 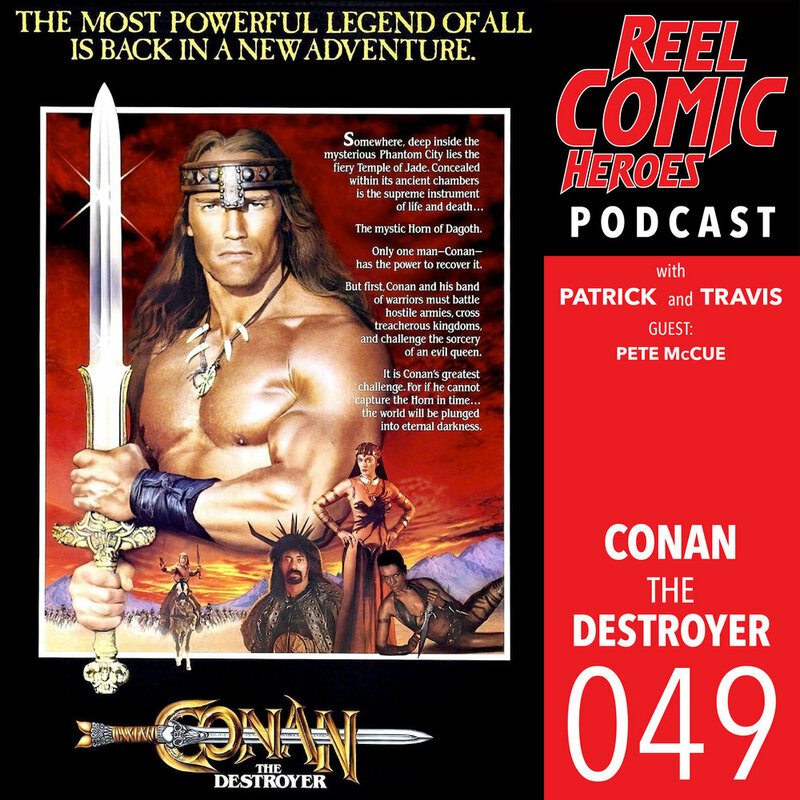 Pete returns to witness the awesome might of Arnold Schwarzenegger once more as Conan. 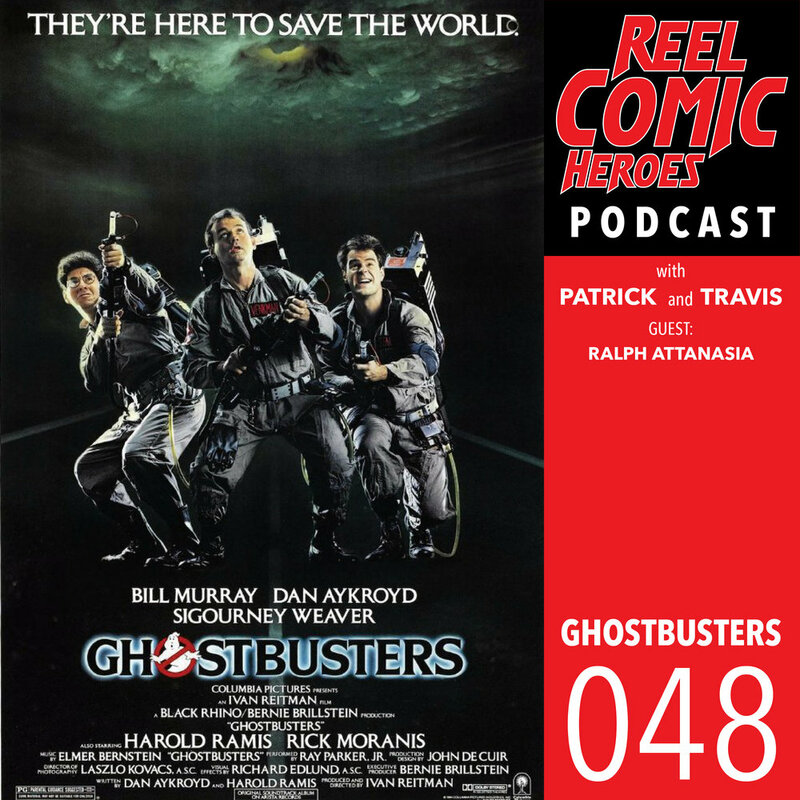 On this episode we were lucky to have been joined by Ralph Attanasia (Cake Boss) to talk all about 1984sGhostbusters. There’s no denying this movie is a huge part of the 80s and is loved by so many. We had a great time talking about Ghostbusters with Ralph even though he tried to kick one of the members of the podcast off the show and replace him. All of our episodes are now available on YouTube. Click here to listen to the episode. Welcome back Citizens, to another space-faring adventure! This episode we’re defying orders and logic to seek out an old friend. We’re talking all about Star Trek III: The Search for Spock. We couldn’t do it alone, so we enlisted the help of Scott Carelli from Dueling Genre. Scott is a podcasting powerhouse. He is the host of multiple ‘Movies by Minutes’ shows and also runs a network which provides many other podcasts a place to call home. We had a lot of fun and got to know the original crew of the Enterprise quite a bit more. And we’re happy to report that the “only even numbered Trek movies are good” is a garbage statement. You can (and should) check out DuelingGenre.com to see everything Scott has in the works. If you’re a fan of Spider-Man, Back To The Future, or Doctor Who, you’ll be glad you did.